Charles Roehrich mans Booth #188 at the Holiday Market 2018 and displays his watercolors of Oregon scenes. I’ve been out to the Holiday Market at the Lane Event Center four times now, shopping like a squirrel under an oak tree. What I love about the Holiday Market is that vendors sell only what they make--this is 100% art from the heart of the people who live here. There’s live music, an international food court, and a Farmer’s Market. I met a lot of people as I wandered around, and last Sunday I met two very different but very wonderful artists. In Booth #87, I met a feral photographer too shy to be photographed, as beautiful as she was in her cowgirl hat and quick, intelligent eyes--Tyler Zefron of Elmira. She takes black and white film photographs and develops them in an old school dark room then paints them using photo oils. One of Tyler Zefron's haunting images in her booth # 87 at Holiday Market 2018. Her photos are of lonely places--abandoned rooms, ragged curtains in a window, big Western skies. Her frames are recycled, refinished, and repainted. Her images are haunting and dreamlike, in muted colors you can get lost in. 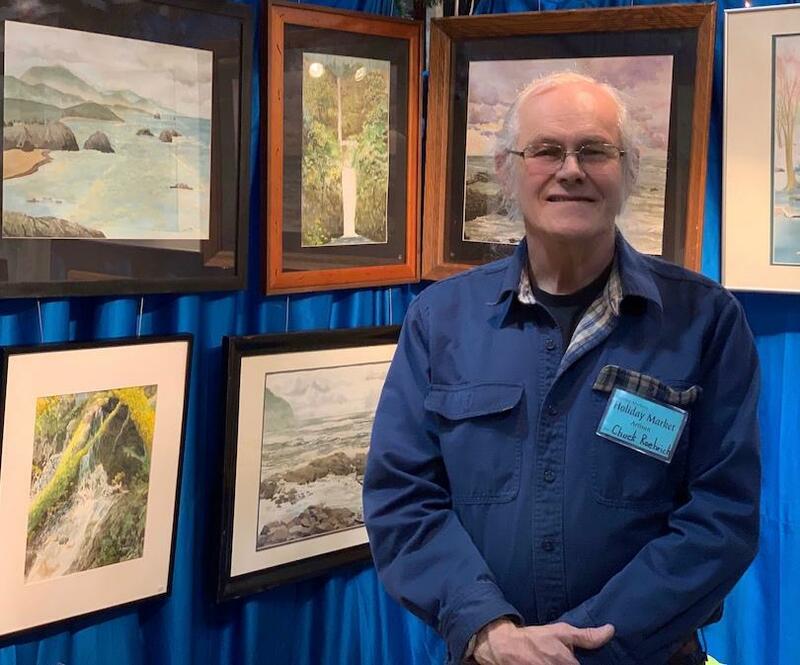 Way across the hall in Booth #188 is Chuck Roehrich whose light-filled watercolors of Oregon scenes seems to be stopping a lot of people in their tracks. Chuck is a seventies-something painter who started out in life with an art degree from OSu but left art behind for a career with the City of Eugene in Wastewater Management. When he retired, he said he picked right up where he left off in his passion for painting. Chuck works from sketches to catch light and dark then completes paintings in his studio. His palette is very appealing and full of what I call spirit light. Portrait of Charles Roehrich, Watercolorist exhibiting and selling Oregon scenes at Holiday Market 2018, Booth #188. You still have three more days of the Holiday Market--next Saturday through Monday the 22nd through the 24th 10 to 6, closing at 4:00 Christmas Eve. Happy Holidays from Viz City, co-produced by Terry Way and Sandy Brown Jensen. Kindista is a social generosity network that aims to assist people by connecting them through sharing. The first Kindista Holiday Market: Buy Nothing and Share Freely will be held on the Friday after Thanksgiving at St. Mary’s Episcopal Church in Eugene. 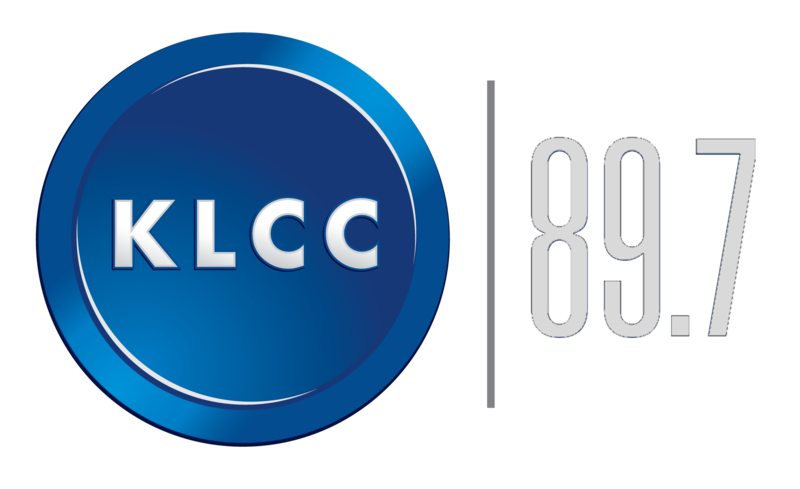 Benjamin Crandall, co-founder of Kindista, speaks with Eric Alan.